The Queue: It's a good thing I'm so financially responsible! So, can you gift things with money from you Blizzard Wallet? Like, if I buy enough tokens can I gift my sister the piggy mount? She really really loves pigs…. Yep! Just hit the box labelled “gift” when you buy it. Alternately, you can just “gift” her the Blizzard Balance she’d need to purchase it, assuming your accounts are in the same region. QfAdam, or anyone else in authority here at Blizzard Watch: Why did you have an article about the flying pig mount, but not put in the video of it? I had to go to another site to watch it. We wrote the article before the video was out! The info was published and circulated in China first, so we had the details but none of the polish that comes with a Blizzard announcement. I believe we’ve pushed an update with everything else since but if not I’m going to do so as soon as I’m finished with writing this response. ROWSDOWA WANTS TO TALK ABOUT CASH TOO, YIKES. What would it take for you to accept a WoW sub cost increase? Content-wise, business model wise, anything. In terms of inflation, $15 USD in 2004 is nearly equivalent to $20 in 2018 — actually $19 and change, but still. If they did increase the price I’d understand the move per se. However, since 2004 microtransactions are now a thing. I wouldn’t be surprised that this is why cosmetics for cash came about, honestly. 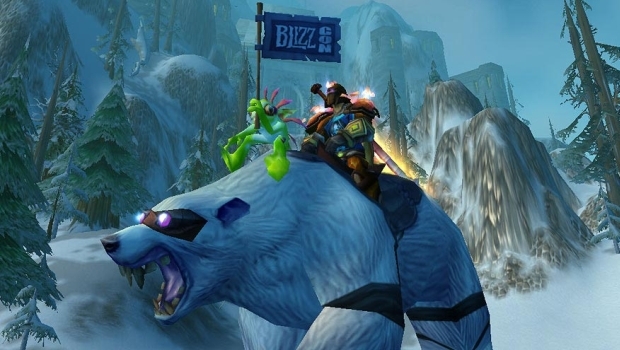 Like Blizzard Balance for gold, as soon as in-game items were traded on loot cards they were up on eBay, so Blizzard knew the market was there. I do wonder how sustainable that is in the longer term, but it seems like kind of a jerk move to both add lots of cash shop items and increase sub costs — even if it is just to compensate for inflation. One thing I’m curious about is whether they’ll allow Blizzard Balance transactions for WoW Classic. I’d be absolutely against people trading real money for gold — farming lanterns off goblins in Stranglethorn to afford a 40% speed increase horse is a rite of passage, dang it! However, it seems kind of crappy that they’d make people who want to play WoW Classic pay for a WoW sub without also giving them the option of converting their gold to Blizzard Balance somehow. Why, as a gnome, do I have to fight Mekkatorque? Back in the day, there wasn’t really a way to get the full story and lore of Warcraft unless you went out and bought the novels, comics, and the like — or read through sites like this which analyze and discuss the same. I don’t have anything against reading of course, but I always thought that was kind of an odd move given the innovative ways a video game has to tell a story. Games are like a movie, but not only does your character get to control the action directly, as a result you have a higher degree of investment in the story and empathy for the characters. WoW doesn’t do this as directly as narrative games, and they’re a bit hindered by the multiplayer aspect in terms of typical tools single player games can use to tell the story, like “camera” angles and pacing. With this expansion in particular they’ve been working toward having narrative choice matter, and the story is — perhaps arguably — being more artfully written and executed than ever before. However, they always allowed you one central narrative choice straight out of the box. I’m small for a human so I naturally identify with Gnomes, even if I’m mostly playing Horde right now. I’m all of 5′ 2″, and I’m obviously a huge nerd, much like Gnomes. I want no part in taking down the High Tinker, same as Liz. It feels awful in a lot of ways that my sole, very central choice in the narrative — who I want my character to be — is essentially taken away here. However, the reason is a good one I can get behind. By putting everyone through this conflict, I don’t have to go read a book or comic to figure out what happened. For one of the first times in a split-faction conflict, we see what everyone sees. I will say that sometimes not getting the full story is good narrative sense. The split in the narrative justification of Camp Taurajo and the ambivalence from the community as a whole that arose was good storytelling for the escalation of the faction conflict into Mists of Pandaria. However, the debate over whether that action continues to rage to this day. With the Battle of Dazar’alor raid, we’re getting to see the full story all at once, and that’s a great thing.